DEEP SOUTH AUTOMOTIVE is very proud to offer another handpicked cherry of a 4x4 truck, perfect Carfax!!! 2012 FORD F-150 LARIAT 4X4 CREW CAB - Turbocharged 3.5 Liter Ecoboost - Leveling Kit - Brand new Moto Metal Wheels wrapped in brand new Federal Off Road tires - 4x4 off road package - leather - heated and cooled seat package - power sliding rear glass - keyless start - back up camera - running boards - AM/FM; AM/FM CD/MP3/Satellite/6 Disc changer - towing package - and much more!!! This is a super clean and great running truck!!! Extremely well maintained and beautiful inside and out!!! We have gone through the truck completely and found no mechanical issues, leaks, or lights on the dash. Body is straight and shines like new. Interior is clean with no foul odors. All electronic components work without any issues. 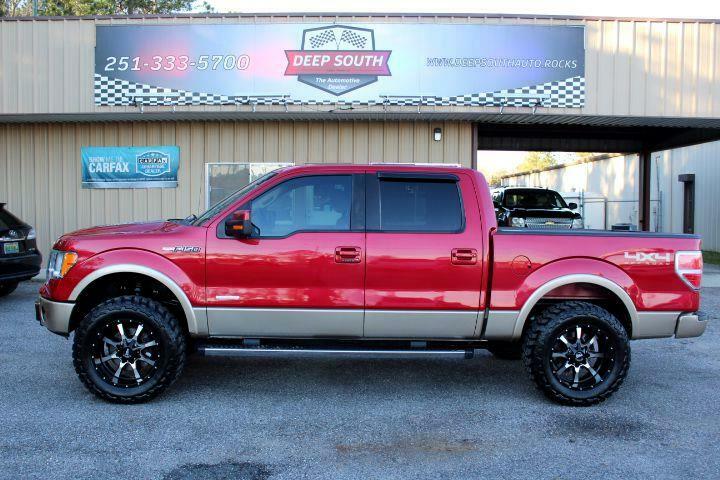 131K miles $20500 CALL 251-333-5700 OR TEXT 251-422-2762 WWW.DEEPSOUTHAUTO.ROCKS for more pictures and information DEEP SOUTH AUTOMOTIVE 8800 AIRPORT BLVD across the street from Baker High School next door to Avis WE ARE PROUD OF THE WAY WE DO BUSINESS AND YOU WILL BE TOO!